Rubbed against something the wrong way during the night or something...the area of my back near the shoulder blades has a pesky itch that could only be purged by a nice scalding shower. It has me wondering what would come through that spot on my skin.. wings? How huge a span would I need to get off of the ground? I figure it'd have to be at least 45 feet or something... I'm over 6 feet tall and my bones are hardly hollow. 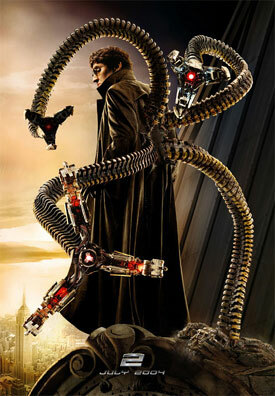 Somehow, I'd be more likely to expect Zim/Otto Octavious-style manipulators and extensor-legs. It's going to be tricky, avoiding all the chocolate next week. Doing my annual viewing of the Ten Commandments, some of the best scenes (snake-staff, for one) were interrupted by news of Miami fires, possibly deliberately set. I hope no one was hurt, or lost homes as a result of those. I really think that they could've picked a better-named spokeswoman for Miami-Dade Fire Rescue than Vicki Burns. There was a haze off in the distance, but I couldn't smell smoke from here. Back to the movie... When I was a boy, I thought that the Hebrews leaving behind Moses should have had elephants, for some reason. Horses in Egypt always struck me as odd; I figured that they'd just use camels for everything, or oxen to pull the bigger things. I wonder now what camel meat tastes like... man eats ox all the time, and horse now and then... is camel considered a domestic food? 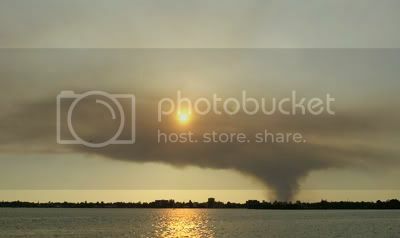 Smoke from a brush fire burning on the edge of the Florida Everglades in northwest Miami-Dade County is seen at sunset from North Bay Village, Saturday. Buildings on the horizon are located in northeast Miami. Well, it's off to the monthly recap Monday morning. Wish me good luck, and happy travels, dear journal. Current Mood:I'd like a pumpeknickel bagel, toasted. VS had a lunch meeting, so I dined alone today... wandered over to the Denny's next door in a semi-stupor. I was rather drowsy and semi jet-laggy just as a result of all the assorted Nevada / Michigan, and now Ohio duties I've got to keep track of. My first visit inside that Denny's... it seems wrong to eat at a place like that during normal daylight hours. My mindset was that I was having an out of body experience, though I was still in my body. I was sort of vegging out... there was a feeling as if my life essence was inside me, but sort of swirling around like smoke, and not flowing through my veins and filling the flesh-vessel properly. My foot-stuff was in my liver, eyes in my knees, and so on. Some sort of mental stun. I was communicating fin, but there was a lack of focus... a fuzziness around the edges. Happy Day! A shiny Maryland Quarter in my change! A good omen, and it served as a lens to bring my thoughts into focus and a spring into my step.